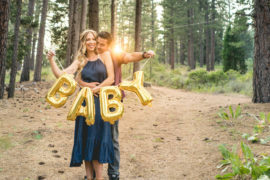 This maternity shoot was an absolute dream!!!! I kept putting off when we were going to shoot because I really wanted it to be snowy but then the forecast would always change and the snow would go away! We shot these at 37 weeks, which I feel like was pushing it, but I am so happy we waited and were able to take them and he didn’t decide to arrive early. It was pretty cold while we were shooting because it was actively snowing as well, so I wanted to share some of the BTS pics to show I wasn’t all that crazy. I wore sweats, boots with snow spikes under my dress, and a jacket in between shots. The umbrella came in handy too so my hair wasn’t completely soaked in a matter of minutes. We really should invest in another umbrella though because poor Michael was drenched! Oh Well! As for this dress, I wasn’t able to link it and I couldn’t even find anything similar because it is 6 years old. This dress is non-maternity and I had to do some alterations to it so I could even put it on over this giant belly. I wore this as maid of honor in my cousin’s wedding and it’s just been sitting in my closet so I thought why not?! The black portion of the dress is actually just a crop top I found in my closet and then the bottom was a dress I made into a skirt. I just cut the top of the dress off which was a sweetheart tube top. I had to cut that portion off because the waist sat too low when worn as a dress and I needed the beaded waistband to go above my bump. I hated cutting up such a pretty gown, but I knew I’d never wear it again, and what better way than one last time for some snowy maternity pics? !